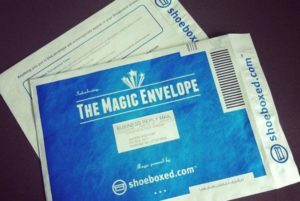 Tax season may be over, but that doesn’t mean you should stop sending in receipts to Shoeboxed! Whether you live for inbox zero or are always on the go, we have a method of getting your documents to us quickly and easily. We constantly strive to offer new solutions to make your life easier and more productive! Here’s a quick recap of all the ways you can send your documents to Shoeboxed for processing. Gmail Receipt Sync: The first set-it-and-forget-it, automatic receipt processor! Simply link your Gmail account to Shoeboxed under “settings” in your account, and we’ll spot incoming receipts and automatically process them into your online account. Shoeboxed Receipt and Mileage Tracker: Our mobile app is a free download for iPhone and Android. The app lets you snap a photo of a receipt, enter a note, tag it as Reimburseable or Deductible, and submit it to Shoeboxed for processing. Web Clipper: The Shoeboxed Web Clipper is the easiest way to send things to Shoeboxed directly from any web browser. The Web Clipper is a free download for Safari, Firefox or Internet Explorer (click here) and Chrome (click here). Simply navigate to the page you want to submit for processing, click the Shoeboxed icon and it will capture and submit everything on your current web page. You can also ‘clip’ email signatures so the contact information will be imported into the business card section of your Shoeboxed account. Desktop Uploaders: Our Desktop Uploaders are an easy way to submit documents on your computer straight to Shoeboxed without having to access your online account. The Desktop Uploader is a free download forMac and Windows. receipts@shoeboxed.com: Send eReceipts to this email as a single dropbox for you to forward eReceipts to! We’ll detect which account to put the receipt in based on the sender. Magic Envelopes: Simply toss all of your receipts, bank statements, and any other paperwork that needs to be scanned into one of our famous Magic Envelopes for processing. Drop it in the mail, then watch as your account is magically populated with digital receipt data– and images of your scanned receipts! Our Magic Envelopes let you send in stacks of physical receipts and paperwork. So, what are you waiting for? Try out a new way to get your documents to us today. Improved E-mail Receipt Filter Released!